Please welcome Django Wexler on the 3rd stop of The Thousand Names Blog Tour. 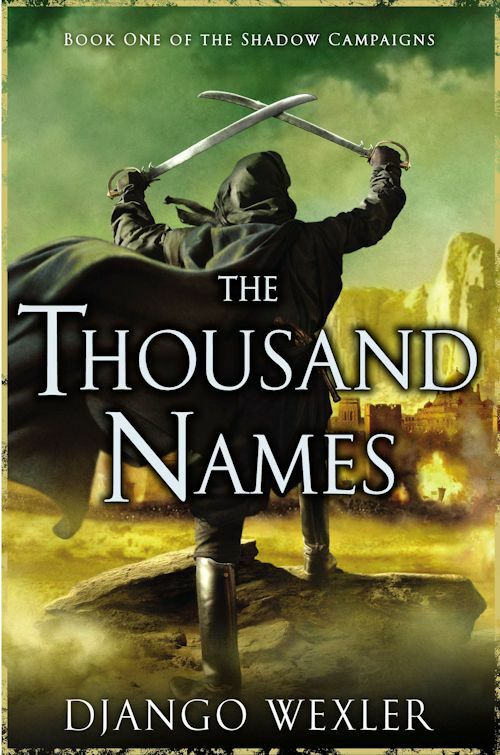 The Thousand Names is the first novel in The Shadow Campaigns epic fantasy series. Time for a trip down memory lane—assisted by the pages and pages of notes scattered in random folders over my computers and their backups—to examine how the final version of The Thousand Names came to be. The earliest reference I can find is as part of another project I was working on in 2006 and 2007, which in my notes is labeled as “Unforgiven (Fantasy).” It was, to put it mildly, a bit ambitious. I had sketched out an enormous fantasy world, with several continents, an elaborate magic system with eight Wells of Power and five grades of strength, and one of those timelines that begins with “0—The world is created.” There was an incredibly subtle overarching plotline to be woven throughout many, many novels, until it would finally all be tied together in an earth-shattering conclusion which (in hindsight) I would probably die of old age before I actually got to write. I actually wrote the first of these novels—called Gaze into Shadow (which may see the light of day eventually in one form or another), it was about a city-state of mages being taken over by vampiric demons. Part of my future plan was to introduce another, low-magic section of the world that had advanced to a Napoleonic technology level, and to tell the story of a man who conquered it and eventually came into conflict with the vampire-demon-mages. Or something like that; my notes get a little vague. Anyway, the conqueror’s name was Janus bet Vhalnich. After hitting a few roadblocks, I came to the conclusion that the problem was the scope of the book, and started narrowing my focus. In one false start, called The General and the Queen, I dropped the Khandar storyline entirely and went directly into a story of intrigue and revolution in Vordan itself; much of that background, if not the actual words, ultimately went into the second book of The Shadow Campaigns. Finally, I restarted the Khandar plot on its own, beginning right at the point where Janus stepped off the boat—that choice of where to start proved to be the critical factor. The new project, titled simply Janus until I thought of something better, still went through some serious changes before I got it to a place I was happy with. Janus and Marcus were pretty much settled, and I knew I wanted the third major character to be female, but she went through many incarnations. For a while she was Janus’ younger sister, a headstrong, happy-go-lucky type who would get into trouble and eventually become Marcus’ love interest. But the book felt unbalanced, and after a great deal of effort and angst I realized that Winter (as she had now been named) needed a story of her own, not just a supporting part in the Janus/Marcus story. It took a few more iterations to figure it out, as I was a little afraid of the “girl joins the army in disguise” device being overused. Advice from my alpha readers (along with some interesting historical reading—it really happened, not once but hundreds of times) convinced me that classics are classics for a reason. Once I got to work on Winter’s back-story, it clicked neatly into place. That takes us up to roughly Fall 2011, when I started querying agents. The book has changed further since, in line with the excellent advice of my wonderful editors, and after so long it feels a bit strange now to think of it all being set in stone. (Or type, anyway.) It’s been a long, weird trip, but I feel good about where it’s ended up. And now it’s on to Book Two! Book One of The Shadow Campaigns! Oooo, I'm wanting this one. I think I need it. :) It sounds like it goes so well with my fantasy likes. :) Thank you.